3 Crashing Biotechs: Is 1 a Buy? Here's why Aegerion (AEGR), Vivus (VVUS), and Exelixis (EXEL) are healthcare's worst performers this year. Healthcare has been on a run this year, but not all of the companies in the sector have gone higher. These three have all dropped by more than a third this year. Given their dramatic sell-off, let's take a closer look at what's behind the drop in Aegerion (NASDAQ:AEGR), Vivus (NASDAQ:VVUS), and Exelixis (NASDAQ:EXEL), and see whether any of them offer an opportunity. 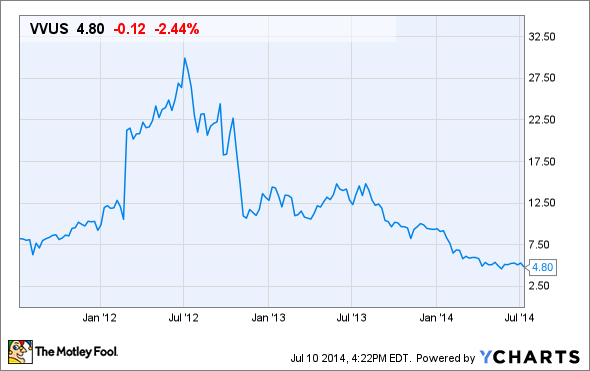 After peaking at nearly $100 per share last fall, shares in Aegerion have tumbled more than 50% this year. Expectations were high when Aegerion won approval for Juxtapid in December 2012. The drug, used to treat homozygous familial hypercholesterolemia, or HoFH, carries a sky high price tag of roughly $235,000 per year, making it one of the most expensive treatments on the planet. A high price and widespread enthusiasm for orphan drugs overall drove shares to lofty levels that have proven tough to justify. Sales of Juxtapid, which competes with Sanofi and Isis Pharmaceuticals' Kynamro, totaled $48.5 million last year and $27 million in the first quarter. Although its first-quarter sales growth was solid, results were shy of expectations, and that forced Aegerion to lower its full-year sales outlook to between $180 million and $200 million. As a result, investors headed for the exits. However, now that shares have been cut in half, valuation is starting to get more intriguing. With a market cap of just $850 million, shares are trading at between four and five times sales and, while that's not cheap, it's not out-of-control expensive either. The company isn't expected to turn a profit until 2015, but analysts continue to think that Aegerion could generate more than $5 per share in EPS by 2017. If it can deliver on that lofty earnings outlook, shares would be undeniably cheap at these levels, but that's a big if. 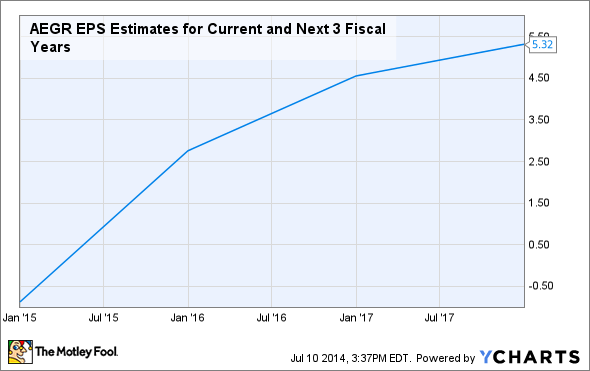 AEGR EPS Estimates for Current and Next 3 Fiscal Years data by YCharts. Lackluster sales for Vivus' highly anticipated obesity drug Qsymia are to blame for Vivus' ongoing slide from its peak near $30 per share back in 2012. So far this year, shares have fallen 45% to less than $5. Expectations were high leading up to Qsymia's approval in 2012. Thanks to estimates that pegged as many as a third of Americans as obese, analysts had attached billion dollar blockbuster potential to Qsymia. But, despite those bullish predictions, demand has been slow to develop. That lack of demand could stem from the reluctance of doctors to prescribe the drug given that one of Qysimia's two active ingredients is phentermine, a drug responsible for Wyeth's $13 billion fen-phen settlement. Regardless of the reason, the reality is that sales remain anemic at just $9 million in the first quarter. That gives the company a $36 million annualized sales run rate that still makes the company look expensive, even with a market cap of just $500 million. Exelixis shares are down 45% this year; however, that entire drop is tied to just one month: March. It was in March that independent monitors of Exelixis phase 3 prostate cancer trial said the trial should continue rather than be halted early. Investors hoping for an early end to the trial, similar to Medivation and Astellas' phase 3 trial for Xtandi, took that as a sign that Exelixis wasn't the breakthrough drug they had previously anticipated. That could prove true... or not. Investors won't know for months. Because the trial is continuing, we can assume the drug's safety isn't in question; but whether its efficacy is good enough to win away share from Johnson & Johnson's $2 billion a year Zytiga, or Medivation and Astellas' fast-growing Xtandi, remains to be seen. Investors should get top-line data from the trial later this year; but in the meantime, Exelixis is burning through cash. Sales of Cometriq in medullary thyroid cancer, or MTC, totaled just $5 million in Q1, yet the company spent more than $54 million on R&D, and nearly $15 million on SG&A in the quarter. Risk-tolerant investors may find that Aegerion is the most intriguing of the three. Even though the company has cut its guidance, Juxtapid remains on pace to post robust sales growth this year. However, that growth is vital given that Aegerion's pipeline is nonexistent. While hope springs eternal for weight-control drugs, the market has yet to embrace Vivus' drug and, until it does, I'm staying away. Meanwhile, Exelixis' Cometriq may be intriguing, and may have legs in other indications beyond prostate cancer; but buyer beware until I can feel confident that sales are going to offset its massive appetite for spending.